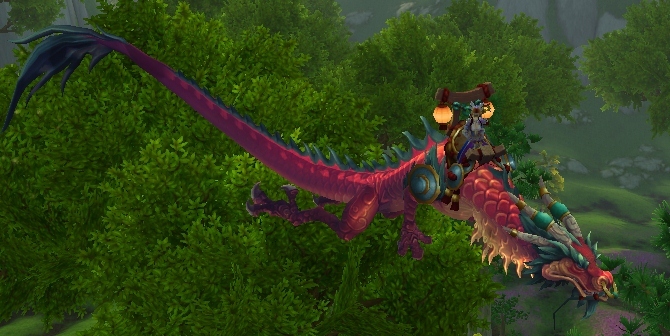 So first couple of days in Pandaria and I have over 40 screenies with dragons in them. Just dragons – everywhere!! I can’t help myself, I would say I am spending almost as much time taking pictures of dragons as I am actually questing! (possible exaggeration)! I am just amazed at how wonderful the artwork is! I was tempted NOT to hand in the quest in which you have to collect the 4 little dragons, just so I could have them wth me all the time, but I figured they wouldn’t last out of the area or even if I logged out…I didn’t want to tempt fate…but I loved having four of them trailing around!! This is also being added to my headers because it is pure win! Here are some more that I got to ride on or past or around! I am in heaven!! DRAGON HEAVEN TELL YOU!! Looks like a cool game. Dragons rule!